This collection of essays is based on the talks and given at the Conference Explanatory Gap held at the Department of Philosophy, University of Belgrade, 1-3 April 2005, in memory of our friend colleague Professor Nikola Grahek. 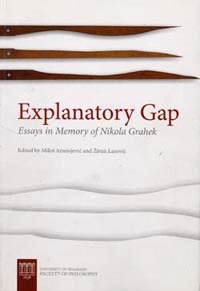 We choose Explanatory Gap to be the title of the Conference and, consequently, of this collection, bearing in mind that it concerns the question that had strongly attracted Nikola’s attention during his dealings with philosophy from the very beginning (which is clearly visible in his first book Matter, Consciousness and Knowledge, published in Serbia). But we allowed the explanatory gap to be understood in a broud sense as covering not only the related phenomena in the philosophy of mind but in epistemology, philosophy of science and moral philosophy in general.